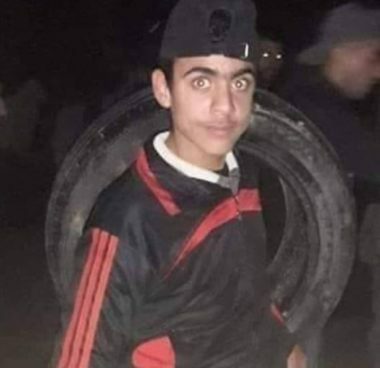 A Palestinian child died, on Thursday at dawn, from serious wounds he suffered late on Wednesday evening, after Israeli soldiers shot him with a live round, and injured several others, during protests on Palestinian lands, close to the perimeter fence, east of Gaza city. Dr. Ashraf al-Qedra, the spokesperson of the Health Ministry in Gaza, said the child has been identified as Saifeddin Emad Abu Zeid, 15, from the Zeitoun neighborhood in Gaza city. He added that the child was seriously injured after being shot by the soldiers with a live round in the head, east of Gaza city. Medics rushed the child to the Shifa Medical Center in Gaza city, before was moved to surgery, but succumbed to his serious wounds a few hours later. Dr. al-Qedra also stated that the soldiers shot at least five other Palestinians and caused many to suffer the severe effects of teargas inhalation.